The average cost of a bad hire is around 30% of first-year earnings, plus the hidden costs in productivity, morale, and your corporate brand's reputation. There are plenty of things you can do to avoid bad hires. 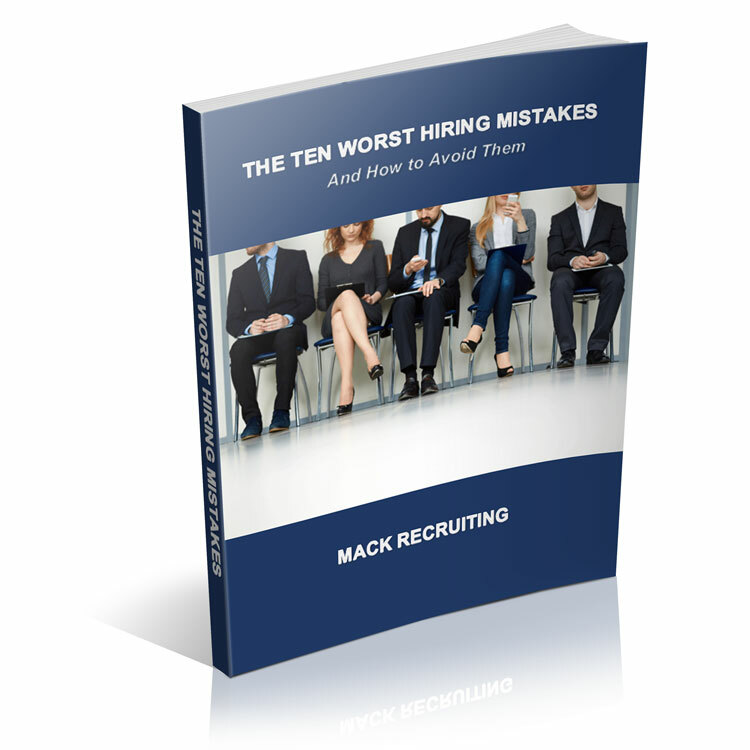 Mack Recruiting has identified the ten worst hiring mistakes – we’ve seen them happen repeatedly. DOWNLOAD THE FREE REPORT NOW to get the actionable insights you need to avoid bad hires forever. Thanks! Now check your email for the Free Report download link. There are a lot of technologies and tools available today that leverage the efforts and results of a recruiter who is willing to invest in the future. Personal commitment to delivering results and business experience are the real keys to a successful partnership. Contingency fees are high for two reasons. Staff adds overhead and confusion in the recruiting business, and most larger recruiting companies have a lot of overhead. Over 50% of the fee covers this overhead, including owner’s salary, expenses like rent and phones, and typically a lot of managerial overrides. In other words, one of the reasons fees are high is that the fee pays a lot of people who have nothing to do with the search. The other reason is the unpredictability of success. It’s the contingency relationship that creates a high fee. Multiple recruiting firms rushing to fill the same job creates a situation that eliminates any possibility of providing you with a thoughtful selection of candidates. It rewards whoever gets the resume of the person that you hire on your desk first. Good recruiters look for predictability in their assignments. They also prefer to handle assignments professionally. We have a program that motivates the right type of behavior, gives us predictability, and gives you the best talent. Large staffs can also create turf battles that complicate your relationship with a recruiting firm. Here, both employers and candidates will end up talking to me. If there is a question or problem, you will know who to call.